He married a sweet, happy, creative woman. 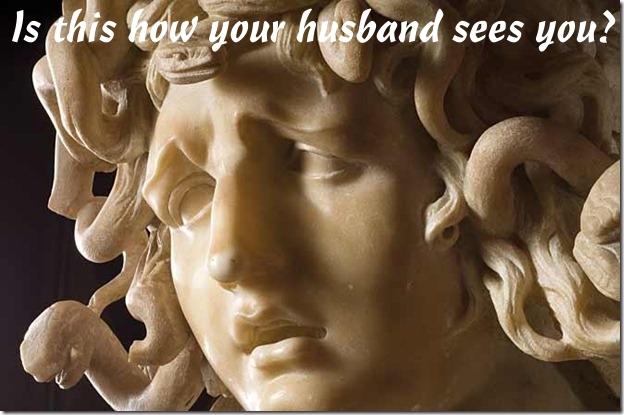 Now he’s dealing with a stone cold Medusa… or an enraged Lyssa*… he may feel he’s opened Pandora’s box and his life will never be the same. For 20 years, I’ve had a lot of very frustrated patients who say to me that they would do almost anything to get their hormone problems under control, feel happy, not crazy and lose the hormone-caused weight. The first thing these patients tell me is all the things they’ve tried that didn’t work. Many of these women have also discovered that most drugs and hormone supplements are a dead end. They work for a time, but you will ultimately be left in worse condition that when you began. With hormone problems, what’s needed is an entirely new approach that actually works to restore health so you aren’t back in the same trouble in a few months. It’s not just you. Look around you! Everywhere you see women with hormone problems, weight problems, immune problems, and depression and concentration problems. Nothing is working for these women, either. These chemicals are in foods (herbicides and insecticides sprayed on your vegetables, hormones given to animals), in plastics that you eat and drink from, in drugs and in the air you breathe. They are unavoidable. Tremendous scientific study since the 1960’s shows the damage these toxins cause, but because of vested interest from huge chemical companies and food processors and because it’s known that YOU will never understand the danger, almost nothing has been done about this until this year, when finally the EPA began a major program to IDENTIFY these chemicals (still nothing to prevent them from poisoning you). There is a LOT you can do, to limit your exposure and to help your body recover from damage done by these toxins. In my experience, the single most effective action I can take with a patient who has hormone imbalances is to reduce the toxic load from these chemicals. Get educated. The main reason these toxins are so destructive to health is because almost no one actually understands what they are, how they damage the body and how to avoid them successfully. Come to a free Hormone Workshop presented in my office every week. You will learn all about how your hormone system works and what goes wrong. You’ll learn how to avoid these toxins and what can be done to help your body recover from any existing exposure and damage. The first step is to get informed about this problem. If you have weight, immune, hormone or emotional problems you should come, but if you are also diagnosed with a thyroid problem of any kind, you must NOT miss this workshop. “My husband and I both went to the hormone workshop at Alternative Health Atlanta, and that seminar has changed my life in just three treatments. Yes, I said three treatments! I began to feel a little burst of energy after the first treatment and I slept 5 ½ hours which was very unusual for me. After the second treatment, I could not believe it, I was scared to tell anyone how much better I felt, I thought it might go away! I am almost free of pain and I have so much energy. My husband says my attitude and sense of humor have returned. I am now ready for a new day each morning and feeling good again. OOPS, I can’t forget the 8 pounds I lost in this one week. I know the symptoms are going away which makes me feel good again. I felt this was possibly my last hope and now I know I can have hope of getting totally better. How much better can this get? I can truly say I KNOW IT WORKS! Thank you to all of the staff at Alternative Health Atlanta, you are all wonderful!” —G.P. This is a truly amazing event. You will leave with an understanding of why you have had so much trouble with your health and exactly how to proceed to recover. We serve healthy refreshments, so please confirm your attendance with us and let us know how many guests you are bringing.